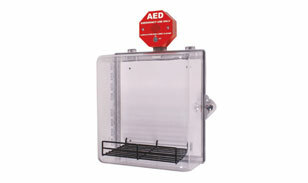 This AED cabinet can be easily mounted to the wall and features an alarm that sounds when the door is opened to help deter theft and tampering. The AED cabinet features slightly rounded corners and comes complete pre-drilled for easy wall mounting. Clear AED cabinets allow AED's to be completely inspected to assure readiness and make AED's more visable to would-be rescuers from all angles. Size: 12" x 14" x 6.37"